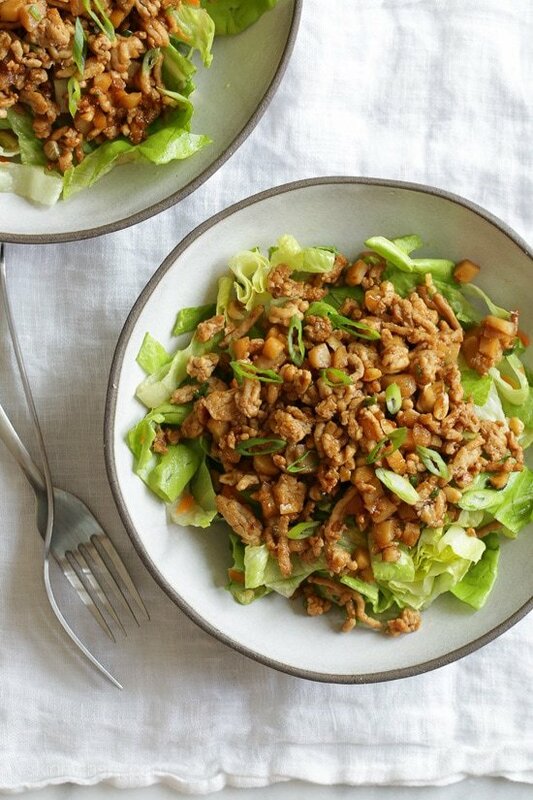 You know those yummy Asian Chicken Lettuce wraps often served as appetizers? Well this one is served over a big chopped salad! 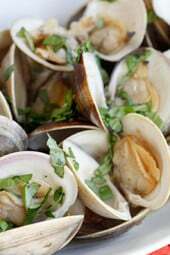 So tasty, and a great way to take an appetizer and turn it into a main dish salad! 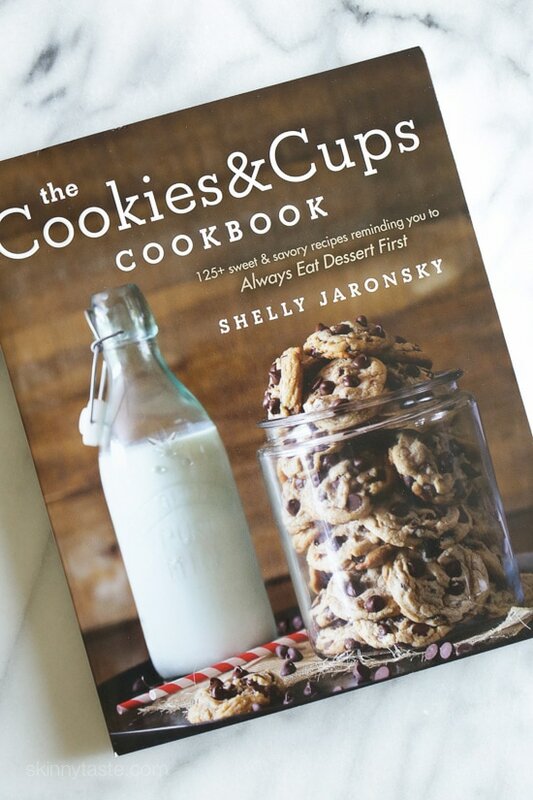 I wish I could take the credit for this idea, but the recipe came from my friend Shelly, the author of The Cookies and Cups Cookbook! Her book is filled with amazing desserts, many I plan to try on those special occasions when you just need a good dessert! It’s also filled with some savory dishes, such as this salad. If you love to bake, this book is a must! I really love how quick this meal came together, it probably took me 15 minutes start to finish! This would be great to make ahead for lunch (why not make this a salad in a jar!) or hearty enough to enjoy for dinner. 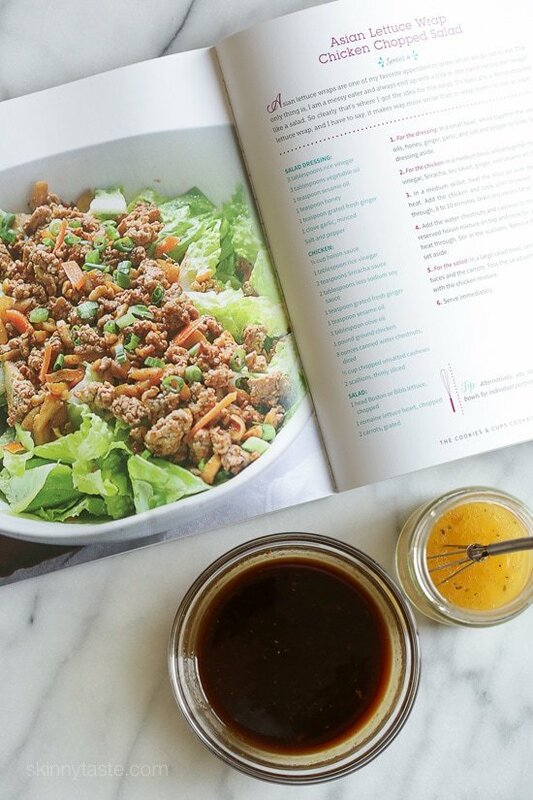 For the dressing: In a small bowl, whisk together the vinegar, oils, honey, ginger, garlic, and salt and pepper to taste. Set the dressing aside. 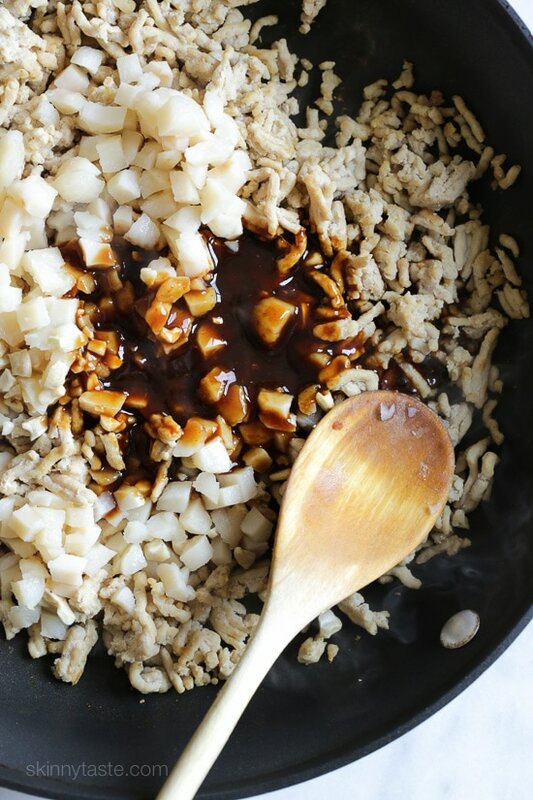 For the chicken: In a medium bowl, whisk together the hoisin, vinegar, Sriracha, soy sauce, and ginger. Set aside. Heat a medium skillet over medium-high heat. Spray with cooking spray then add the chicken and cook until browned and cooked through, 8 to 10 minutes. Add the water chestnuts and cashews to the pan. Pour the reserved hoisin mixture on top and cook for 1 to 2 minutes to heat through. Stir in the scallions. Remove from the heat and set aside. 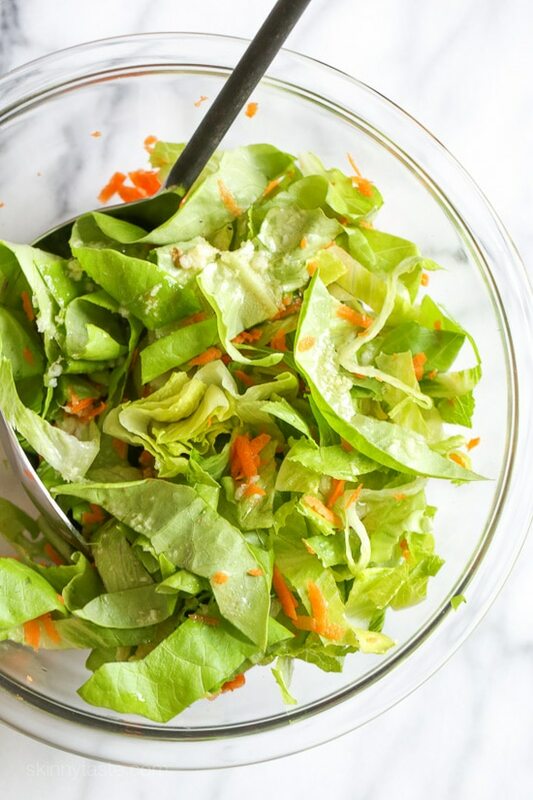 For the salad: In a large salad bowl, combine both of the lettuces and the carrots. Toss the salad with the dressing and divide in 4 bowls. Top each with 3/4 cup chicken mixture. Rather than serving these Asian Chicken Lettuce Wraps as an appetizer, everything is served over a great big chopped salad! Light, quick and easy to make! I made this for dinner tonight. It was fabulous! I loved the synergy between all the ingredients … just wonderful! This, and the spinach lasagna roll ups are my favorites so far. A keeper. For sure! I hate to say it, but this is a step up from the lettuce wraps. The dressing on the salad adds another level of flavor. Thanks, Gina! Delicious! Made with turkey instead of chicken and just as tasty. Will make again! This was very good! Loved all the blends in the sauce and dressing. I tried to find ground chicken at the store today but they did not carry it. So I bought ground turkey instead and used that. Still very good. I thought I had cashews at home but it was peanuts so I used them. I will be making this again. Maybe if I cannot find ground chicken, I will try and pulse some chicken breasts instead. My husband and I made this last week’s and it will be back again this week. So good, and made a wonderful next-day lunch. We chopped our own chicken, since we didn’t have ground chicken, and it was fantastic. Thank you! 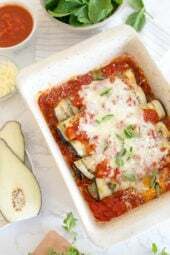 Just mad this the other day and OMG it is delicious, will be making again for sure! When I calculated it out on the WW site, it only had 5 points! I am starting with my own chicken breast that I will pulse in the FP until coarsely chopped, instead of using ground chicken. I like the texture better. I’ve made this several times, and we love it! I was wondering, though, could I mix together the chicken and dressing and freeze them, to add to fresh lettuce later? Or do I really need to keep the chicken and dressing separately? This salad is chock full of flavors! The spice is just right. Just as good or better, and certainly less messy ,than lettuce rolls. 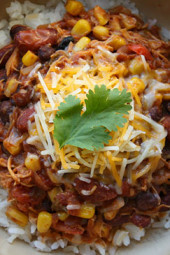 Your recipes are delicious and healthy, a great combination! I love this recipe, I want to make a large portion of the chicken for my lunches. Could you give me the macros for just the chicken? I made this today for lunch. It was delicious! Can’t wait for leftovers. Made this into salad jars for this week’s lunches. So good!! Order of things in the jar: 1) dressing, 2) shredded carrots, 3) meat mixture, 4) lettuce. Please keep the great salad ideas coming! I make 8 salad jars every Sunday for my husband and me to last the work week. We are always looking for new ones to try. Thanks Gina! This dish is awesome!! Taste like lettuce wraps from a restaurant. LOVED IT!! !Made this tonight for the first time and my fiancé and I both loved it! Soooo good ? I make this recipe almost once a week. We love the Original Lettuce wraps from the Restaurant but since I’m on WW, I needed a lower point option. We don’t care for the water chestnuts so I just don’t use them. I don’t always make the salad dressing, either, if I don’t want the extra points. We LOVE this no matter how I make it. The Ground Chicken is always the star! Do you have the nutritional facts for just the chicken mixture? Sorry, I don’t have that handy. I just did some math and may be off, but its is about 87 fewer calories per serving without the salad (so 245 for just the chicken). This was awesome! My husband even raved about it! I’m just starting down my road of healthier eating and signed up for WW. I’m curious though, the ground chicken that you used…is that the 97% fat free? I didn’t have any ground chicken, but had chicken breasts so I ground those up at home and used that. Using the recipe calculator it came up with 4 Freestyle points. I’m not sure if I’m missing something, or it’s just with the change of the chicken. I love this recipe! So easy yet tastes like you have spent hours in the kitchen! We add a mushroom melody to the recipe at the same time as the water chestnuts to add a bit more flavor! Leftovers are even better than the original. Absolutely delicious! Will definitely make it again.